Good Morning! Happy Friday! I am so pleased it is finally Friday, I work today and then I am off for a week on Vacation! I can’t wait to go in to work and get it done! Summer came all at once here in Halifax… It is stinkin hot here but thankfully we have air conditioning so when I find some time next week to spend in my craft room I will be nice and cool. 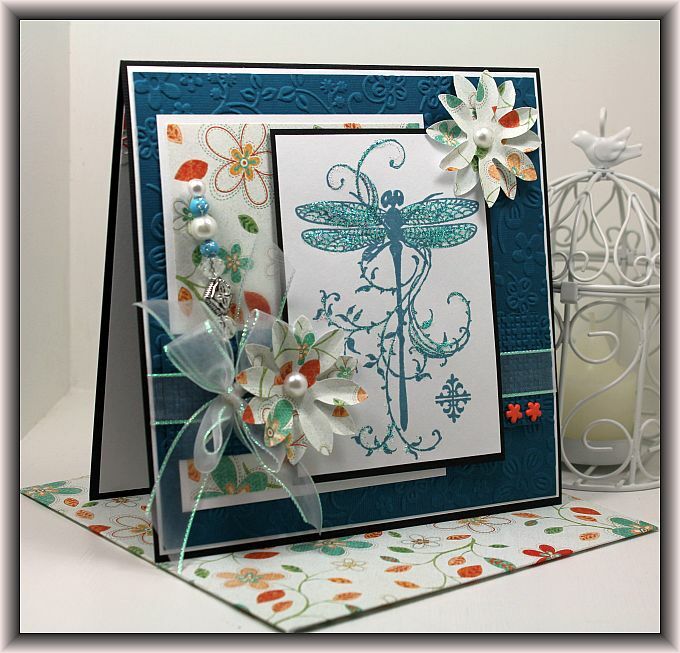 I have another 6 x 6 card to share with you using the Stampendous Dragonfly Vine stamp (that Carol snatched right out of my hands and bought a couple of weeks ago). But no worries… I stole it back! LOL!! Check it out…. Check out that pretty design paper… I have been hoarding three 12 x 12 sheets of it for over a year but I felt it was time to make something with it. There is always new beautiful paper coming out and there is no need to hoard it. The paper is by My Mind’s Eye and it is probably discontinued by now but oh well, I really enjoyed making this card and matching envelope so it was a good purchase. 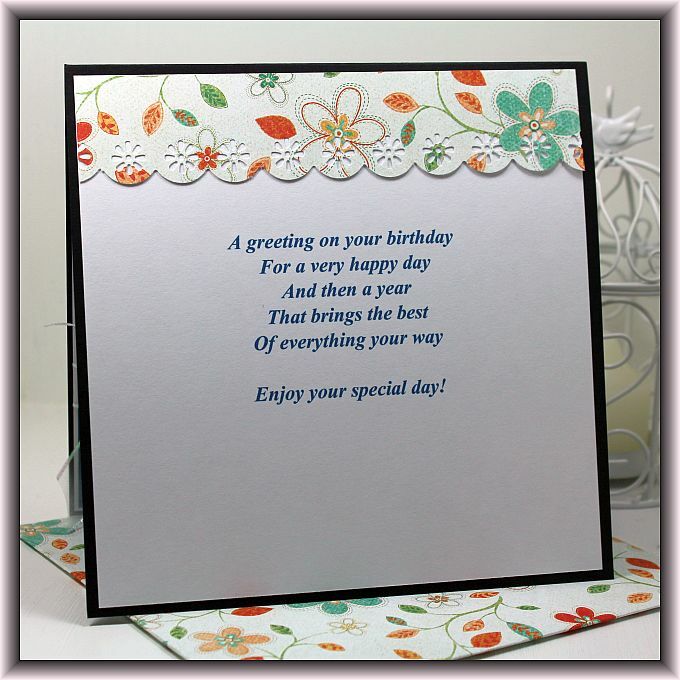 I chose a simple birthday sentiment for the inside and printed it on the inside and dressed it up with a little scrap of the design paper. 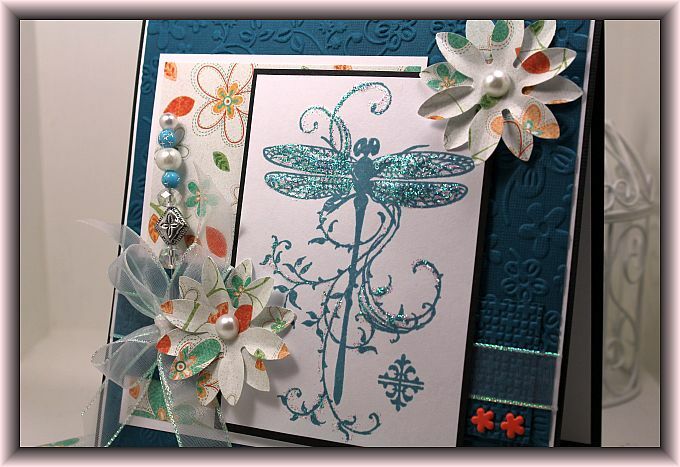 I also added some lovely stickles to the wings and the vines around the dragonfly to make it shimmer. I finished it off with a pretty bow, handmade pin and some lovely punched flowers using the rest of the scraps from the design paper. I hope what I have shared with you today inspires you to get crafty and create something that will make someone smile. This probably sounds a little corny but when I post something pretty to share with you all each morning it starts my day off in such a positive note. I really enjoy blogging my crafty adventures and sharing my ideas with you all. Thanks for subscribing, I love it that you are interested in my silly crafty creations! Have a wonderful day and thanks so much for stopping by. This is one of my favs of yours for sure LIsa! LOVE the colours and that gorgeous dragonfly! I had been looking at him at Michaels for awhile! The Queen of stick pins! Love it! This card is Stunning, I love it!! I enjoy seeing what you have created each day!! This is a great card! I am always inspired by your creations! Hope your work day goes quickly and you have a fabulous week off! Oh OH OH I have to HAVE that stamp!